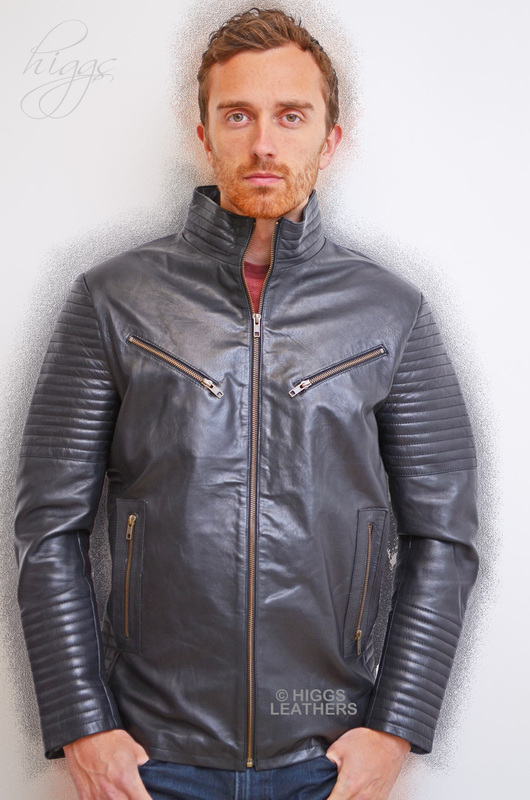 Men's latest Designer style Black Leather Biker jackets, made from soft quality Lamb Nappa skins. Fitted body with tailored sleeves and deep mandarin collar that can be zipped up high in the neck or turned down away from the face. Intricate padded stitching detail in the collar, both top and bottom of the sleeves and in the sides of the body. Full size lower pockets plus two medium size breast pockets all with metal zips. Two inner pockets edged with leather. Body fastens with a strong metal zip. Can also be individually made in about two weeks in other colours for an extra £30 (please see "Colour" option box below).